We are excited to showcase our custom wood doors in Scottsdale and the entire Phoenix Valley. Sun Mountain, Inc., today announced the opening of its sixth showroom nationwide, in Scottsdale, Arizona. This new outlet will also provide delivery and after-the-sale service to customers in the Phoenix area. The showroom is located in The District at Airpark, 15444 North 76th Street, Suite C100, and neighbors many other building product suppliers in the area. It features nearly 40 custom doors including sliding barn doors, folding wall doors, and traditional hinged doors. The products are shown in a variety of wood species and designs, including modern, rustic, and classic styles. Additional displays feature the company’s factory-applied wood finishes, mouldings, door hardware, and hardwood flooring offerings. 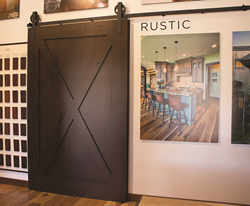 Founded in 1998, Sun Mountain manufactures custom wood doors and wide plank flooring for luxury homes nationwide, at its state-of-the-art production facility in northern Colorado. In addition to its new Scottsdale location, Sun Mountain operates showrooms in Berthoud and Colorado Springs, CO, Asheville, NC, San Francisco, CA, and Park City, UT, and operates a national sales force. Sun Mountain offers over twenty wood species, numerous designs and customization options, factory pre-finishing, and pre-hanging. The company sells direct to the trade or homeowner, offering a competitive value. The Scottsdale showroom, managed by Bill Barger, can be reached at 480-435-0933 or azshowroom(at)sunmountaindoor(dot)com. Gary Webb serves as Regional Sales Manager for Arizona, and can be reached at 480-435-1306 or gwebb(at)sunmountaindoor(dot)com.